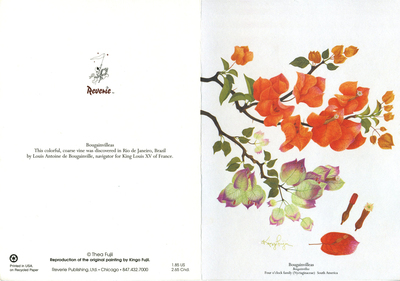 Bougainvilleas illustration originally done for the Encyclopedia Britannica for a flowers of Hawaii section. The illustration was reproduced for a greeting card (seen here). It is unclear if this greeting card went into circulation or not. This is from Kingo Fujii's personal collection.